It was a wicked dilemma: A championship run would be the trump card in convincing Kevin Durant to stay in Oklahoma City, but to make that run, the Thunder and Durant would have to take an unknowable risk with his right foot. In the end, Durant’s body spoke, and pushed a resolution upon an organization that is a mere 15 months away from a generational superstar hitting the free-agent market amid an unprecedented cap boom. Serge Ibaka is out at least a month after a knee scope, raising the possibility that he will miss some or all of the first round should the Thunder make it. A healthy Thunder team without Ibaka is still a dangerous animal, but it is hard to see them defending well enough to topple the juggernaut Warriors — the league’s best scoring team. The Thunder and Durant are making the right choice, but it comes at a huge cost to the organization: It has likely lost its last chance to chase a ring with Durant before he becomes the most talked-about expiring contract since LeBron James in 2009-10. James became a free agent at a time when it was unusual for a half-dozen teams to court him with max-level cap space. Durant will enter free agency upon the biggest salary-cap leap ever, a one-summer blip in which damn near every relevant franchise will be able to lavish a max offer upon him. A few might even give Durant the chance to pick his preferred max-level free-agent teammate. The Thunder will put on a brave face. They will say they are confident, that they look forward to the opportunity — how’s that for reframing? — to show Durant that they’re the team for him. But don’t let the false bravado fool you. They know Durant leaving is in play. They know the cap landscape. They were the loudest non-Philly voice against lottery reform, whipping up a frenzy of small-market panic. They traded future first-round picks for Dion Waiters and Enes Kanter in separate deals, and though those players are young and the picks protected, those are the sort of win-now moves the Thunder hadn’t engaged in until this season. They are the mark of a team that knows time is precious — that failure today carries a scary downside that is no longer so far in the distance. And as rival executives note, those moves — especially the acquisition of a low-post scorer like Kanter who has a nice pick-and-pop chemistry with Westbrook — provide the road map for a post-Durant team in the worst-case scenario of his departure. Still, the Thunder are right to be confident in their campaign to keep Durant. The James Harden trade hasn’t worked, and was probably not even financially necessary, but the rush to bury the Thunder as the NBA’s tragic unfulfilled champions has always been premature — and sometimes unseemly. This team could have a title by now had Westbrook and Ibaka not suffered ill-timed injuries during the 2013 and 2014 playoffs. The howlers will point out that those injuries are precisely why you don’t trade Harden; the third superstar morphs from semi-redundant to essential the moment another star teammate goes down. The howlers are right, to a point; the Thunder replaced Harden with younger players2 who weren’t ready for the postseason hothouse, and they paid the price. But even with Harden, the Thunder might not have been good enough to win the title in those seasons with those same injuries. Ibaka is especially irreplaceable as the lone scary rim protector behind a scrambling and sometimes spastic perimeter defense. Harden would have improved those title odds, but we don’t know exactly how much. The Thunder considered all of this when they made the trade with the Rockets, and so far, the deal looks to have been a mistake. But that doesn’t mean this team is far away — that it is some pathetic lost cause slogging through the last days of a doomed era, the players checking HoopsHype for the latest rumors about their futures. The Thunder with Durant, Westbrook, and Ibaka are absolutely a title contender. They might be the best team in the league. That makes the unending series of injuries they’ve suffered this season triply painful. This could have been, should have been, a season to go toe-to-toe with the Warriors. The three stars are in their primes, and the return from the Harden deal — the picks, players, and flexibility — was finally starting to bring a tangible on-court payoff. The offense and coaching are still clunky, but this team should have been as good as anyone. Again: The Thunder are right to be confident of their place in pole position of the Durant sweepstakes, even with Durant’s hometown Wizards hoarding cap space. But Durant is now effectively an expiring contract, and impending free agency at that late stage can take unpredictable turns. You just never know. This season was Oklahoma City’s last grasp at certainty, and it’s gone now. Where Does That Leave OKC This Season? The Thunder with their last remaining megastar are still a good team, one game up on the Pelicans for the no. 8 playoff spot, but they are no threat to the Warriors. Eight of their last 14 games come at home, but they have three back-to-backs and only three cupcakes, against Sacramento, the Lakers, and Minnesota on the last night of the season. The Pelicans have more road than home games, but their schedule is just about even with the Thunder in terms of opponent difficulty, and they already own the tiebreaker. Oklahoma City is 8-5 in this latest stretch without Durant, and three of the losses have been last-second heartbreakers against Portland, Phoenix, and Chicago. It has a strong record and scoring margin when Westbrook plays without Durant. It may well hang on at no. 8, even if Durant never plays another second. But the wins, especially the recent ones, haven’t been convincing, mostly because the Thunder cannot guard anyone. They’re 24th in points allowed per possession since the All-Star break. Ibaka and Durant aren’t just stars; they’re two-way players, and without them, the Thunder just don’t have enough of those. 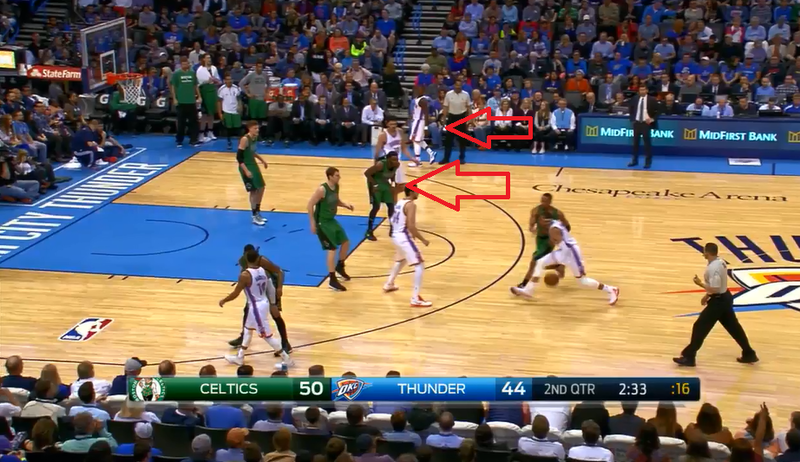 Scott Brooks, not exactly a chess master, has to choose between lineups that can’t score and lineups that can’t defend. Brooks slid Waiters into the starting lineup over Kyle Singler to goose the offense, but Waiters is mostly taking some of the most godawful off-the-dribble 2s you’ll ever see. I’m pretty sure he set an unofficial league record for layups that hit only the backboard against Boston on Wednesday. The offense can get a boost by sitting Roberson and Adams, but Brooks is giving most of their minutes to guys who can’t defend: Anthony Morrow, D.J. Augustin, and Mitch McGary. 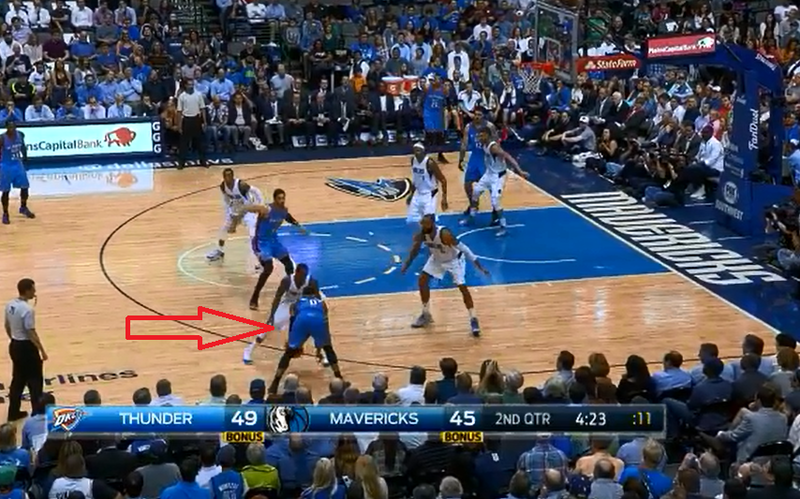 Put two or three of those players on the floor with Kanter, and your defense is going to be a disaster zone. No wonder Utah was anxious to give Rudy Gobert more minutes. 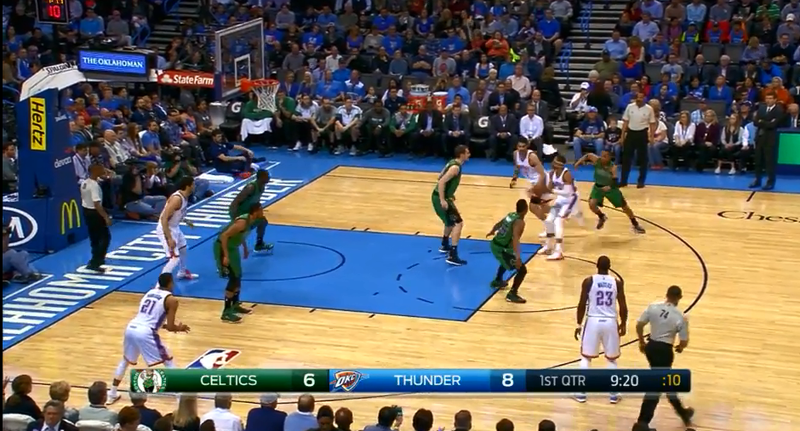 Kanter is a sieve against the pick-and-roll. He runs around and shifts his feet, but his timing and footwork are all wrong, and any top-level ball handler can blow by him into the paint. Several teams have already run the “go at Kanter on every possession” crunch-time offense, and that would figure to intensify in the playoffs. Oklahoma City is allowing 109 points per 100 possessions with Kanter on the floor, even worse than the league’s worst defense. There might be middle ground by playing Singler and Nick Collison more, but Singler has struggled since coming to Oklahoma City, and he’s running out of time to earn Brooks’s trust. Still: If the alternatives are the Augustin/Westbrook duo and whatever it is Waiters is trying to do, Singler deserves more minutes. More of Collison is always welcome, but he’s aging and foul-prone in extended minutes. 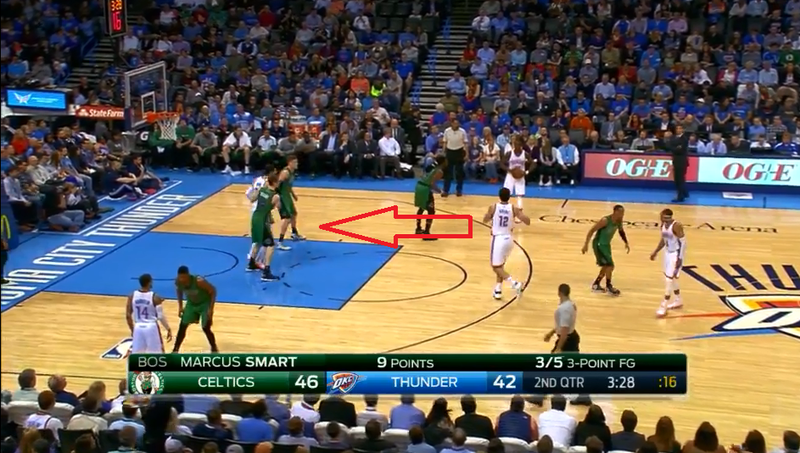 Brooks just doesn’t have a lot of good options beyond letting Westbrook run wild. That’s not sustainable against elite competition — not for Westbrook or the Thunder. There certainly isn’t much of an offensive system to fall back on. The Thunder talked a big game early in the season about using the absence of both Durant and Westbrook to establish a Spurs Lite continuity-based offense. Remember when Perry Jones III scored 68 points combined over three consecutive games? He has scored 95 points since, and is presumed alive. Hell, five of the 11 guys seeing active playing time right now weren’t on the roster at the start of the season. A sixth, McGary, appeared in just one game before February. This wasn’t the plan, but it’s also not an environment conducive to building continuity and chemistry. This is what the Thunder are at this point: a Westbrook-led scoring machine that needs enough 115-110 wins to eke into the postseason. There’s no real drama there. If the Thunder make the playoffs, they’ll likely get stomped by the Warriors and keep the first-round pick they owe Philadelphia (via Denver); that pick is top-18 protected, and if the Thunder snag the no. 8 seed, they’ll likely finish right in the 18th spot — provided the no. 5 team in the East keeps its lead over the Thunder. The Warriors, by the way, are a big winner here. It sounds crass, but that’s reality in the NBA. Almost every champion needs a bit of injury and matchup-related luck along the way, and injuries large and small have affected almost every playoff season. Don’t listen to any asterisk talk, ever. Look at league history and you’ll find that an injury tilted the championship odds at some point damn near every May or June. The Warriors are tops in the league in both points scored and allowed per possession, a rare feat, but even a team that historically rare could stand to avoid an opponent who could reach nearly those heights when healthy — especially in the first stinking round. That is what these Thunder could have been, and won’t get to be, this season. They could still be that sort of team in 2015-16, but Durant’s future now hovers over everything. The Durant issue was already there, but the faint possibility of a dramatic playoff run this season pushed it just a bit off center stage. No more. The Thunder are on the clock, and the future of a franchise is at stake. The NBA can be a cruel, cruel world. A lot of folks have criticized the Thunder for rushing Durant back in the first place, but I’m hesitant to do so. Durant plays an active role in his own health care choices, and what we don’t know about the state of his foot in December and January trumps what we know — by a huge margin. This depends on a bundle of variables, including whether Ibaka gets the max on his next contract. The reason actually wasn’t terrible: Boston had Gigi Datome and Gigi Datome’s hair bun at small forward, one of the rare pseudo-wings Novak can guard.